This is the card that I made for Mrs Soh's birthday on the behalf of my class. (: Rushed it out in like 4 hours the previous night>.< But I think she likes it very very much so all the effort was worth it! :D I think it is a very nice thing to use one's artistic talent to make another person happy! Well it is using your art to spread happiness around! (I think Mrs Soh was very very happy when she received the card along with 36 balloons and a birthday cake) I should make cards more often. I have not been making as much cards as I did before. Well I did make a lot of cards for people in basketball and my parents and friends in the past, but I did not bother to photograph them. ): I shall remember to photograph my works in the future. For those who have seen my Nanyang 95th Anniversary card, you would have noticed that it bears much similarity with the 95th birthday card! The concept is the same and the style is very much like my kimono(with the handmade flowers, buttons and sequins --> Very intricate and delicate stuff). I guess the main difference is that Mrs. Soh's card is more feminine, with pretty colours such as red and pink dominating the whole composition. (Mrs. Soh ♥s PINK!! :D ) I didn't take photos of the NY 95 card because I was too tired that night after completing the card. :/ but I remember that the 2 main flowers are blue and green, so the whole card looks more multi-coloured but not as feminine as Mrs Soh's card. Close up view of big flower! (: Well, the tracing paper flower is handmade and like last year's kimono flowers, the red layers are formed by tracing paper which are dyed with red ink. That is why the red layers look crumpled. Looking at the card, I think that I should have included one more layered handmade flower(this is just a personal opinion).... but overall, I think that it still looks beautiful! The cover of the booklet. Well, not the completed one. When I brought to school the next day for 404 to write their messages before recess comes, I realised that the cover was a little too plain. 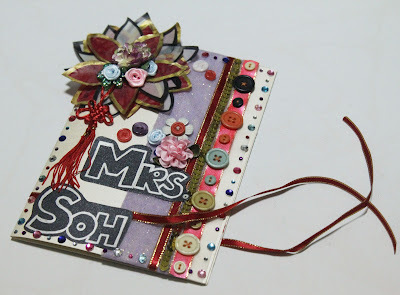 So I added the big text: "To: Mrs Soh" in silver bold outline so as to complement the silver ribbon. (: Oh and I glued down the folded flower petals later cos as you can see from the photo, some petals are folded. Well, but I did not have time to take pics of the improved version cos well, it was a mad rush to let 404 finish Mrs. Soh's card before we surprise her. I really like how there are so many layers and textures on your card/booklet but yet it is not overwhelming at all. The size of the biggest flower, the round overall shapes of the flower and buttons vs the straight lines created by the ribbon, the font itself is in black and white vs the colourful parts of the rest of the card creates this amazing overall balance. I also like how you designed the card/booklet part, making the ribbons hold the pages together and also making the opening process resembling that of unwrapping a present. Well it is really hard to find something not good about this, but you could have spent more time on it instead of rushing it? Though it is still awesome as it is in this state. Finally, take your own advice and make more cards :D It will be interesting to see your other designs with your skills since this is very similar to your kimono design.